Investing in safety surfacing can be a big decision. If you are working to a tight budget, it may be tempting to ask whether you really need a safety surface or whether grass will suffice. While natural grass has its merits, there are lots of reasons why investing in a safety surface could be a good idea. 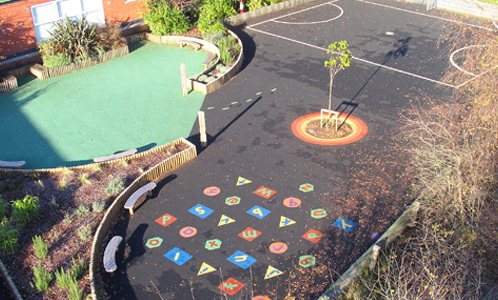 Both resin bound rubber mulch and wet pour are fully bonded, porous systems. As such, any rain water will drain away meaning children can play out all year round without getting muddy or too wet. Including educational graphics can be a great way to encourage outdoor learning among pupils over the years. Educational graphics can range from letters and numbers to help with structured lessons, right through to roadways that help with teaching road safety or targets to encourage skills such as throwing or jumping. Giving children the space to move their bodies as they learn can also help them retain facts from the lesson, through embodied learning. You can read more about embodied learning here. Even with the most attentive supervision, playground accidents happen. Whether it’s from playing with others on ground level or from a raised piece of play equipment children can easily hurt themselves whilst playing and learning. Safety surfacing such as wet pour or resin bound rubber mulch has been designed to absorb impacts and reduce the risk of head injuries. As it is non-slip, it can also help to reduce the likelihood of accidents occurring to due adverse weather conditions. Safety surfaces are becoming an incredibly popular investment for schools that are looking to take up fitness initiatives such as The Daily Mile. This is because they are non-slip and can be used all year round, also resin bound mulch can also be installed straight onto grass in most cases. If you’re interested in the Daily Mile, you can learn more here. Unlike some other surfaces, both wet pour and resin bound rubber mulch are bound with a resin (you can find out more about the install process here.) This means that it cannot be easily moved out of the area by children or damaged/dirtied by animals such as cats. Many of our surfaces also come with guarantees to give you peace of mind for longer. So there you have it! Whilst there are numerous other reasons, these are easily our top five. If you would like to find out more about safety surfacing, or would like a free site visit or estimate, please just get in touch.